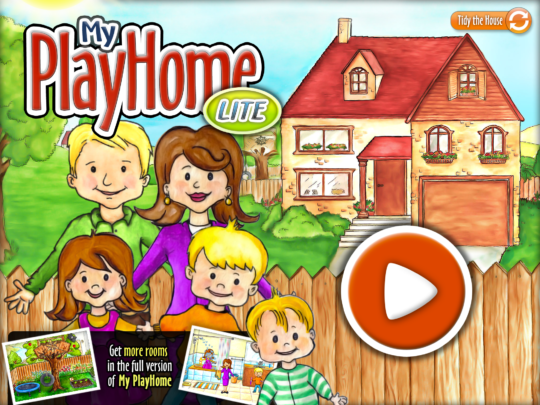 My PlayHome app is one of my favorite apps and is a go to activity for me. The app is basically an interactive doll house. 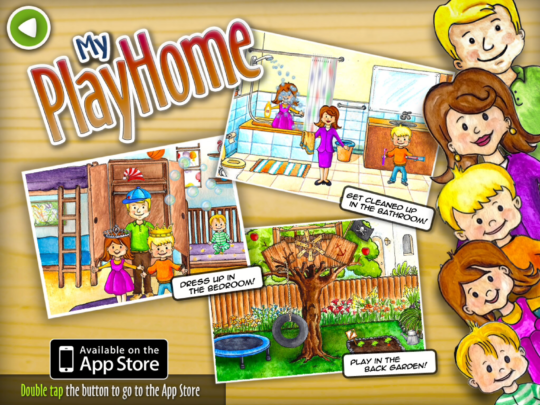 You might recognize the look of the characters and house because there was a popular paper version of this before the app. 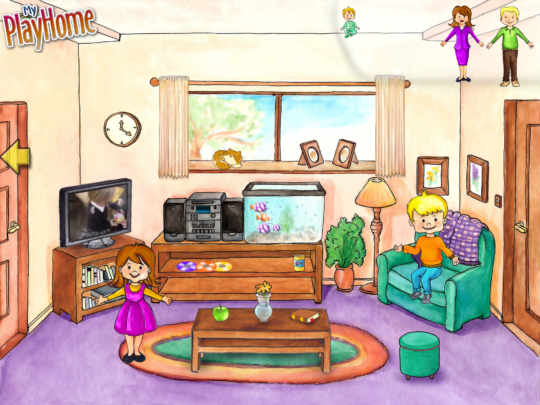 It includes five family member characters to play with in different parts of a house. 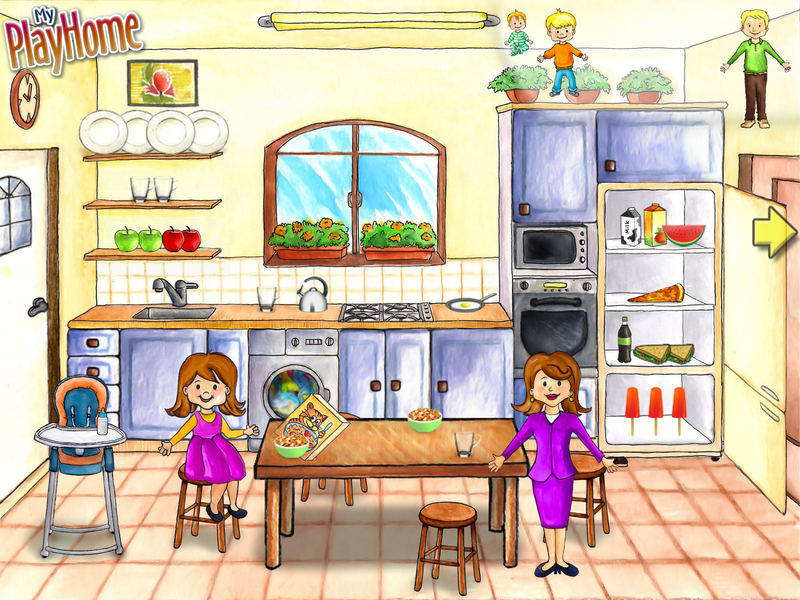 The free version comes with two scenes- a living room and kitchen. The full version offers a bedroom, bathroom, and backyard for purchase. The free scenes are great but I do recommend buying the full version because there are so many ways to target language and the kids have fun using it. The good news is it’s only $3.99 so check it out here. One of the reasons I like this app so much is because kids of many different ages and abilities can use it. We all love when we get a lot of use out of one product. This app is appropriate for students ranging from more typical cognition to special needs students. Younger kids (2-5 years) will enjoy playing with it and I’ve also used it with older students (ages 6-9) who are at a lower cognitive level. As you can imagine, the app is great for labeling household vocabulary. You can work on labeling food in the kitchen as the fridge has a wide variety of food including pizza, watermelon, sandwiches, popsicles, cereal and various drinks. You can also talk about cooking vocabulary because you can turn the stove top and microwave on. 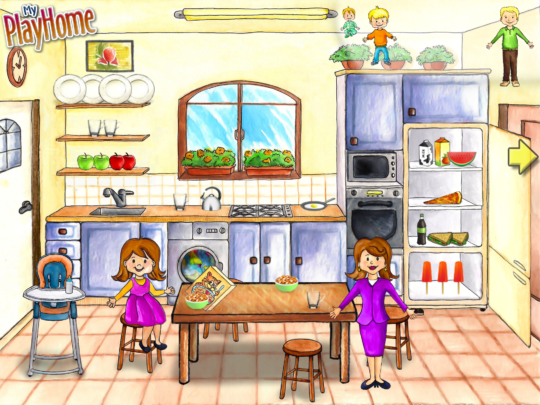 There are so many functional words to label in the kitchen scene, for example: cup, plate, water, food, chair, and window. Another way I’ve used it is to practice opposites because there are interactive features to turn on and off such as the sink water, the TV, and the radio. You can open and close drawers, turn lights on or off, and empty and fill glasses. I often use this app as a reward because my students love playing with it (then I sneak in some extra language practice without them even realizing it!). 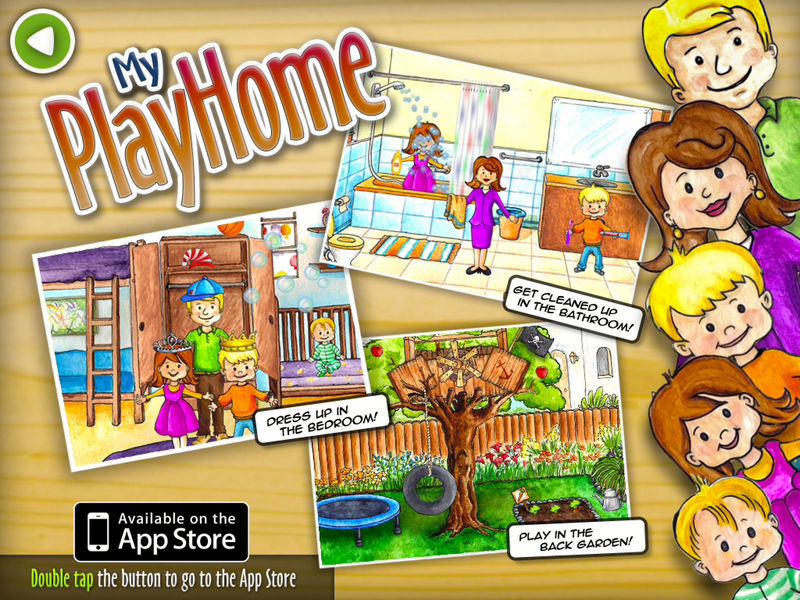 As I mentioned kids love this app so it’s only natural to use it to practice play skills. I like to work on the play skills of sharing and taking turns. Right now I’m working with a little one who has a bad case of the “mines”. Every toy is “mine” so sharing can be difficult. I use the app to increase her tolerance for parallel play. When we play she wants to take my character so I often say “This is my character right now and you have your character. We can take turns sharing them.” This allows for opportunities to teach functional communication too. If you want to use the character I’m using you need to ask rather than grab it. Another great way to use this is to practice having conversations between characters. This is another way to work on the back and forth or turn taking of conversations. I also like to let the students explore the dollhouse-this really fosters imagination and creativity. Aside from the free kitchen and living room scenes, the full version includes a bathroom, a bedroom, and a backyard. The bathroom scene can be used to work on bathroom vocabulary, personal hygiene and daily living skills like showering, brushing your teeth, and washing your hands. The bedroom has a closet with clothes for the kids to play dress up. This allows practice on many concepts like dressing for different purposes (i.e. What do we wear in the winter vs. the summer?). The backyard scene includes a garden, trampoline and swing. There are tons of vocabulary words to use for an outdoor and garden theme (seeds, shovel, hoe, etc). The additional scenes offer a lot more opportunities to work on language and play. Hope you all enjoy this app as much as I do! Sign up for our mailing list here to stay updated with our latest therapy tips, app announcements, and blog posts. Don’t forget to follow us on Twitter, Pinterest, and like us on Facebook!